Part of the show Returning to the Moon - A giant leap for mankind? This week, we found ourselves watching old Star Trek episodes to answer Daniel McGwire's question. Daniel - Is warp travel a possibility? I've read on the internet that NASA is developing this. What do you guys think? Should we be getting excited about warp speed travel and could you explain the process behind this theory? Graihagh - So, is it possible to travel faster than the speed of light or is it just a dream of sci-fi script writers, and if it is feasible, how would it work? Over to Harold White, a physicist who heads the Advanced Propulsion Team at NASA. Harold - General relativity establishes a cosmic speed limit, an 11th commandment as it were - thou shalt not exceed the speed of light. This same theory also provides a couple of loopholes -worm holes and space warps - that can be used to allow someone to make a stellar journey to say, another star system in a time measured in months or weeks. All the while, never locally exceeding the speed of light and of course, maintaining sync with clocks on-board the ship and clocks here in mission control in Houston. 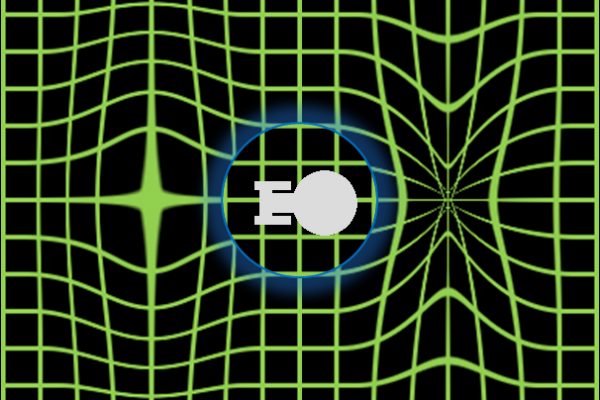 Now, the idea of a space warp comes from the fact that in general relativity, space can expand and contract at any speed. It has no speed limit. Graihagh - So, there's a loophole in the theory of general relativity that would allow for massive distances to be travelled very quickly. What happens is, space compresses and expands around the object in warp, resulting in space-time shifting around the ship. This repositions the ship without ever actually moving it, just like if Earth moved under your feet so you could get to work without ever having walked there. This all sounds very exciting, but could warp travel ever become a reality? Harold - This is actually a pretty tough question. Based on some recent work performed by my colleagues and I, here at NASA and some of the folks at Icarus Interstellar XP4, the concept has been moved from the category of impossible to at least plausible. Now, this doesn't mean that the concept is feasible and this is actually a matter of forward work. There's actually quite a bit of work to do so please help us out by pursuing a path in science, technology, engineering or mathematics and join us in this endeavour. Graihagh - So, it looks like the notion of warp speed might just travel out of sci-fi and into the real world with your help of course. Thank you, Harold White. Next, we'll be searching for the answer to this question sent in by Peace Peter. Peace - How much of my body could I live about? People donate a pint or so blood, a kidney maybe, and can live without limbs. But what's the limit? How much of our body do we really need? Graihagh - So, people donate organs, bone marrow, and even give blood, but what parts of our body are essential for survival? What couldn't we live without? What do you think? Previous How much of our body do we need to survive? Next Can missing DNA be replaced? What is it like to fall into a black hole?